Field Diesel Units are effective in areas where there is a ready supply of crude oil but limited supply of diesel fuel, such as unpopulated areas, remote oil fields or drilling locations. A Field Diesel Unit can fulfill local fuel requirements for power generation and oil production. It can be started or stopped on demand. This unit will extract the diesel component from the crude oil and then blend the products back to sales crude oil. The Field Diesel Unit is split into easily transportable skids, it is quick to install and self sufficient. Sulfur %wt : As in Crude Oil. The crude oil is pumped from storage tanks and pre-heated in Crude – Reduced Crude Interchanger before further heating in the Fired Heater. 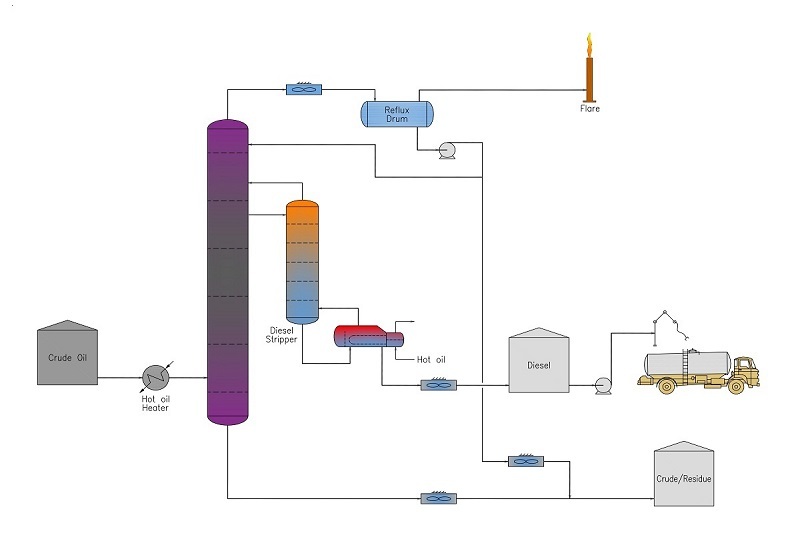 The temperature of crude oil at outlet of Fired Heater is controlled by fuel firing. The heated crude oil is flashed into vapor and liquid fractions in the flash zone of Topping Column. At a pre-determined operating temperature, the diesel fraction is drawn as product from chimney tray under level control into Diesel Stripper. The light fraction is condensed in Overhead Air Condenser and collected into Reflux Drum. Part of condensate is fed as reflux and balance is drawn as lighter product using Reflux Pumps. The uncondensed gas is burned in the crude heater, blended back into the crude, or vented to flare system. The overhead naphtha from the Topping Column is blended with residue from the column bottom and mixed with the Sales Crude Oil.